Beyond Our Ken featured Kenneth Horne with a regular cast performing short sketches. 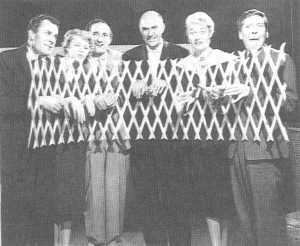 This programme later led on to further radio series with the same cast such as 'Round The Horne' which developed its risqué revue into something riskier. Musical interludes were performed by The Frazer Hayes Four. Written by Barry Took and Eric Merriman.